J.Crew strapless brocade wedding dress. It&#39;s a slight A-line dress with pockets and covered buttons down the back stopping halfway down. Super lightweight material and gorgeous in person. 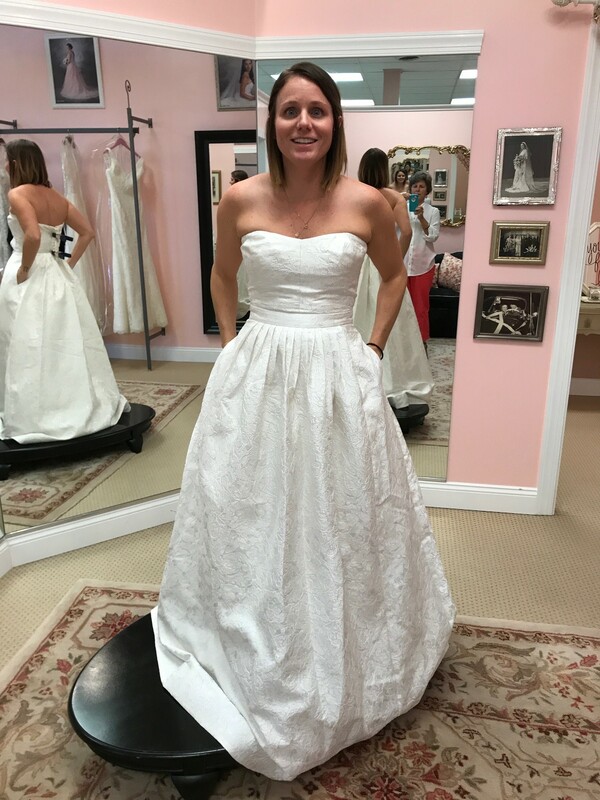 I bought this dress in a size 10 and planned on having it altered but cancelled the wedding before I had any alterations done. I had also planned on having a cover made to go with the dress (sample seen in some pictures). Please note this is for the dress only and that cover is just a sample but it gives a good idea of another option to add to the dress. Favorite memory in dress: Let&#39;s be honest - not every wedding is meant to happen. So my favorite memory will be selling this dress and hoping it goes to someone that gets to wear it down the aisle and feel so beautiful on their special day!